← Veganism: Where to Draw the Line? There’s a growing movement afoot right now, most of it concentrated in the Bay Area, to legalize the backyard slaughter of farm animals. The quest to kill locally is part and parcel with the overwhelmingly irrational appeal of the eat local movement. Of the many flimsy justifications buttressing the argument that urban homesteads have the right to become backyard slaughterhouses, one strikes me as particularly disingenuous: it will inspire more humane treatment of farm animals. The logic behind this claim seems to hinge on the morally amorphous notion that if we deregulate the process of slaughtering animals, the slaughter will become more humane. The idea here is that if we love the animal we kill, then the animal will be happier about being killed. In fact, I think this way of thinking is perverse, and the underlying rhetoric plain insidious. I'm a historian and writer based in Austin, Texas. This blog is dedicated to exploring the ethics of eating animals and animal-based products. You have identified the whole problem with backyard livestock. It has a brutalizing influence on our attitudes towards animals. If we overlook or tolerate cruelty to animals within our sight, what chance do the animals out of sight have? Your write-up about backyard slaughter is appreciated. Most amateur slaughterers don’t know a carotid artery from a jugular vein. This ignorance adds to the cruel death the animal endure in being immobilized in killing cones and having their throats cut. However, it is not true that animals slaughtered by backyard butchers necessarily suffer more than do animals slaughtered in commercial slaughter plants. For example, chickens, turkeys and ducks suffer more because they are subjected to paralytic electric shocks by being immersed, head down, in cold, salted, electrified water before their throats are partially cut, to facilitate the release of their feathers after they are dead, and to immobilize the fully conscious birds on the conveyer belts. The electricity goes through their faces and bodies. The torture is surpassing. The birds are conscious, in agony, and unable to move. And there is much more to be said about the commercial use of gasses and decompression of poultry in commercial plants. People wishing to learn more about poultry slaughter are encouraged to read my book PRISONED CHICKENS: POISONED EGGS: AN INSIDE LOOK AT THE MODERN POULTRY INDUSTRY. It is fully documented. Thank you. Thank you Karen for all that you do to raise awareness of the hidden tortures behind the food industry. I believe that knowledge is power and you are doing more than most people to spread that knowledge. Thanks for this important commentary. Oakland is a pretty violent place as it is, and it worries me that my city is going to encourage this type of activity. 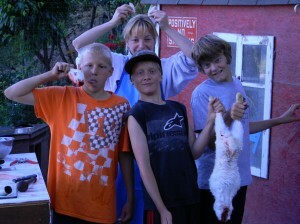 The kids in that photo are clearly “goofing” around, and have no compassion toward the animal they just killed. That is not a good life lesson for parents to teach kids. Since we now have the privilege of knowing where our food comes from, shouldn’t we question what our food is? Anyone can live a long healthy life without killing animals, we should see that for what it is. Progress. It truly is absurd that someone could slit the throat of a chicken, turkey, or goat in their backyard, and be called humane and pioneering – yet if they slit the throat of a cat or a dog in their backyard, people would be horrified and mobs of people would want them punished. Thank you for the free publicity, but you really have no idea what you’re talking about. Perhaps a lack of animal protein dulled what little intellect you may possessed. I bet you spent a total of 30 minutes surfing the Internet for your shoddy information. I think being Vegan is like being Scientologist…. Regarding your statement, “…part and parcel with the overwhelmingly irrational appeal of the eat local movement”, I can’t stop wondering what you mean. In addition to being being wacky about eating animals (which is fine, and your choice), you are against eating local foods??? I must be reading this wrong. How is it irrationally appealing to want to support local farmers by eating foods that haven’t been sitting around or trucked in from somewhere unknown? Or is it irrational to “slaughter” vegetables in our own backyards, too? Can you clarify? Also, I don’t think you know or can speak to “what actually happens when amateurs slaughter animals…” The word actually implies that you have some fact based knowledge, when this is merely your opinion, right? Articulately said, Pam. I appreciate this post, it said all the things that I just couldn’t seem to put into words. I can understand living the vegan lifestyle, it’s certainly a healthy alternative. What I cannot understand is not only did the author compare the backyard butcher to the industrial slaughterhouse giant (whom have repeatedly fallen short in regards to the humane treatment of their animals), but he genuinely suggests that the individual butcher is worse. I also got the impression from this blog that the author was disenchanted with the urban homestead or locally supported agriculture culture/movement. I just can’t wrap my mind around it. I have to agree with Karen. It’s irresponsible to even suggest, as Karen stated, “that animals slaughtered by backyard butchers necessarily suffer more than do animals slaughtered in commercial slaughter plants.” There’s absolutely no comparison. I would be more concerned that the animal was properly provided and cared for during it’s existence rather than how it came to it’s short demise. I fear that your commentary (and others like it) may do more harm than good for the sustainable living and urban homestead movement. While you may personally believe that eating an animal is wrong, most people do not share that view with you. Because of this, it would be more affective to advocate the education of these budding urban homesteaders in more humane treatment of their animals; be they in rearing or slaughtering. It is my opinion that the industrial and factory mega farms and slaughter houses are FAR more detrimental in regards to the inhumane treatment of animals; both in the raising and the slaughtering. It truly saddens me that you would chastise an individual or group of individuals making a sincere effort to live in a more sustainable fashion rather than to make a stand against the obvious atrocities that the industrial farms commit on a daily basis. What I find incredibly interesting about not only this blog post but many of your articles that you’ve written lately is that you seem to actually be SUPPORTING factory farms now. It almost makes me wonder if you’re being paid by them because you seem to so staunchly support them now. New post for my blog thanks! “What a properly butchered Vegan should look like.” Please check out Gardengirlfarm.com and judge me for yourself. @Karen: I use a pipe to kill the rabbits and Carona lopers to cut off the heads of roosters and chickens. As the photographer of some of the other images featured in Gardengirl’s post I feel confident stating that this one image is taken completely out of context in relation to the post in its entirety. In addition the perpetuation of gross misinformation regarding factory farming is disturbing. Cassie opens her farm to a few select minors so they may learn how to lovingly raise animals and the responsibilities that are involved when one decides (and it’s still up to the individual last time I checked) to eat meat as a protein source. Whatever it may look like to you butchering days are weighty ones emotionally. The reality is that when one is used to only seeing their protein neatly wrapped in Saran there is no sense of where one’s food comes from or the journey in between. As a former vegetarian for twenty years I’m grateful to Gardengirl for making my choice to now eat meat personal… Warning, there are graphic images on my blog as well. Raising and slaughtering your own meat (or vegetables) in a respectful manner of love and gratitude is the highest form of eating and living. Human beings have always done this and the biggest problem today is that we have distanced ourselves from this reality. When animals are imprisoned and basically tortured their entire lives in a factory farm–that is cruelty. And please read “Omnivore’s Dilemma” or “Animal, Vegetable, Miracle” and learn the true cost in oil (pollution, wars–and everything related) of non-local food. Thank goodness straw men are vegan, sir, or your writing would go quite hungry indeed. We butchered our own animals this year, first time. I will tell you that the first one or two we did…weren’t the fastest. We did our research, knew our anatomy, but there is still a learning curve. I will tell you that we are much better and faster at it than we began and our methods are now far more humane than they were in the beginning. The biggest difference though is the life the animal led prior to slaughter. Our animals were free range chickens, ducks and turkeys and they led an ideal life of fresh air, interesting foods, plenty of exercise and well cared for. I had very few losses from illness (1 out of 7 turkeys, 1 out of 30 chickens, 0 of 7 ducks), predators and other natural causes which I think is probably because we worked very hard to keep them happy and healthy. I can’t say that for a factory raised chicken or any other CAFO raised animal. I didn’t post any gory pictures on my blog, sorry.